Nam Prik Pla Tu. Today is Buddha day, so as usual my wife has prepared a dish of Nam Prik Pla Tu to take to the local Wat and to give to the Monks. 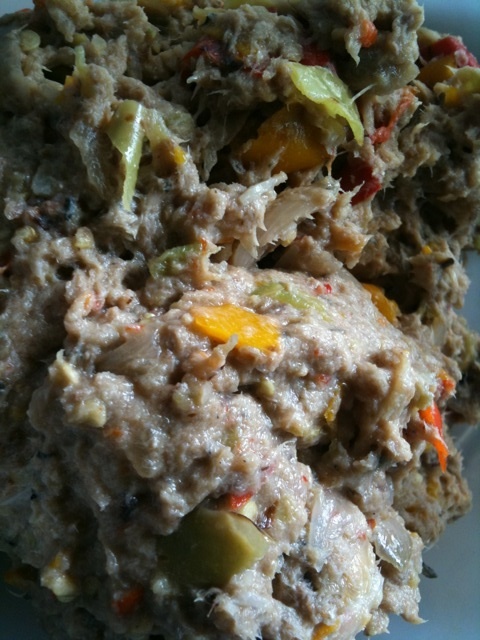 Chili pastes, or nam prik, form one of the main pillars of a Thai meal, and of Thai cooking in general. 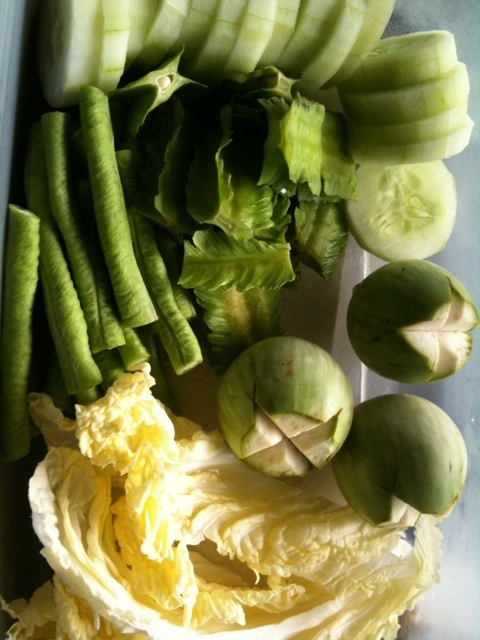 As dip-like condiments, or krueng jim, they incorporate easily portable protein and vegetables, and are frequently the main protein source for a Thai during the day. As the base for a dish, or nam prik gaeng, they build the foundation to a curry, soup or stir-fry; they also make great de facto salad dressings and marinades. In fact, there are few savory dishes that do not incorporate some form of chili paste. 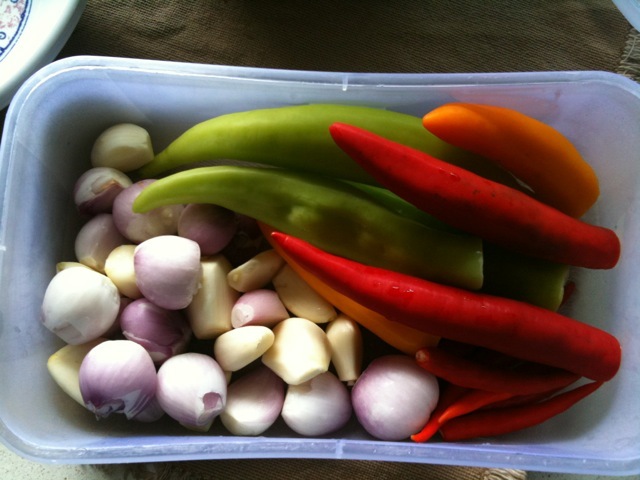 This is the condiment kind, a well-known chili dip that is the main meal for many Thai families. 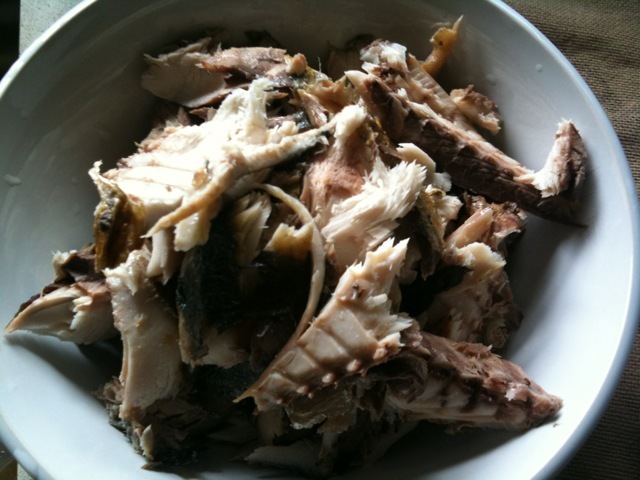 It is also very nutritious, using Thai mackerel (omega-3! 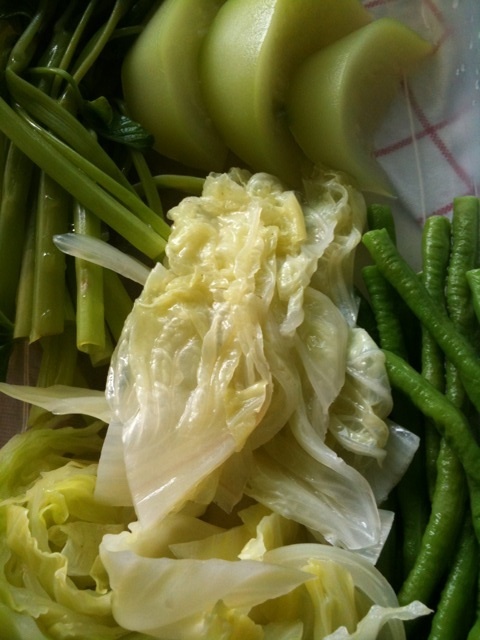 ), fresh and blanched vegetables (fiber!) and very little, if any, oil. 1. 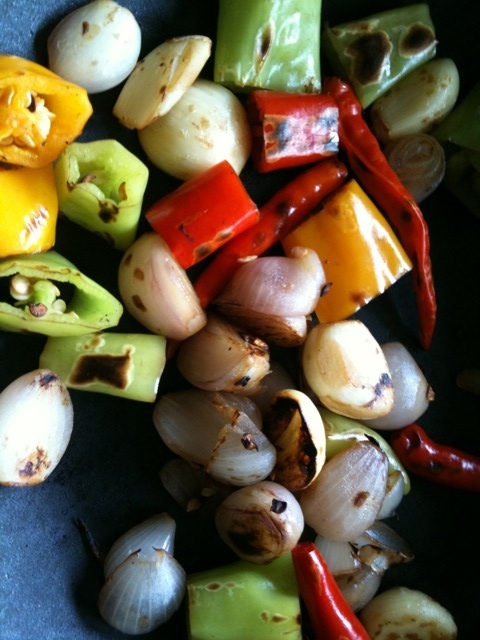 Make chilies, garlic and shallots fragrant by dry-frying them (the process is called kua) in a wok or deep frying pan. Continue until the flesh begins to take on a “blackened” appearance. Take the opportunity to practice your flipping so you can show off to your friends later on and they will think you are a really great cook. (You can also kua by skewering your chilies, garlic and shallots and placing them in an oven at full whack until the flesh blisters and blackens a bit). 4. Add your chicken stock and 2 Tbsp fish sauce. 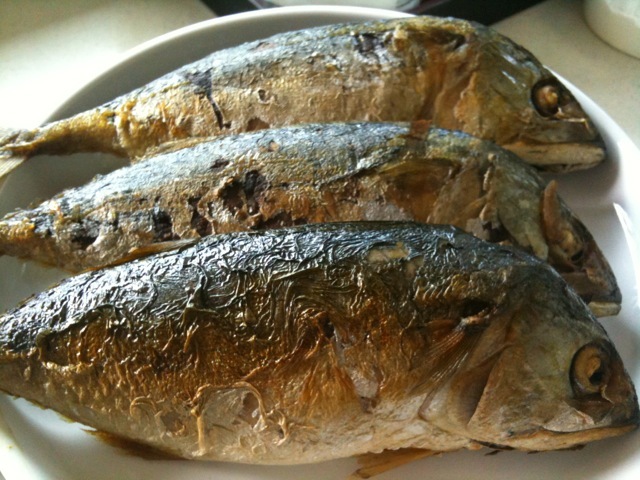 Taste for seasoning and add more fish sauce if needed. 5. Just before serving, add juice of 1 lime, but if keeping for later, make sure to refrigerate (duh). 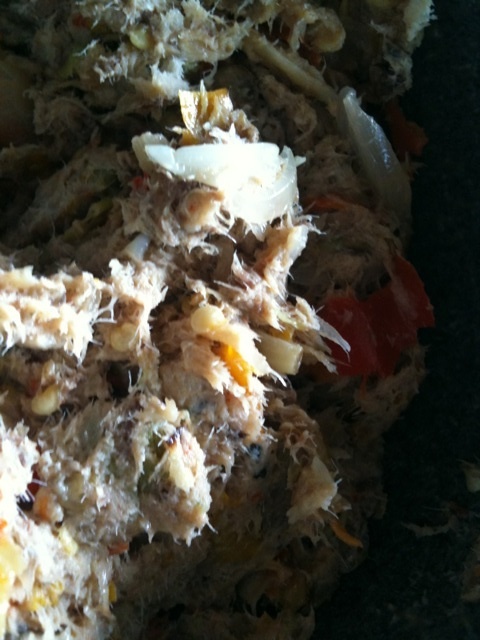 Reheat and add lime juice just before serving, accompanied by fresh and blanched vegetables and rice. *The best store-bought pla tu apparently must have a short face, crooked neck and (obviously) thick belly.